A Cuyahoga County, Ohio jail officer was arraigned on charges that he and another guard assaulted a female inmate while she was restrained, leaving her thinking she might die while in custody. Cpl. Idris-Farid Clark, 31, entered a not guilty plea during his arraignment on a felony charge of felonious assault and misdemeanor charges of interfering with civil rights and unlawful restraint, according to the Cleveland Plain Dealer. Clark allegedly assaulted Chantelle Glass last July, after she was booked on a domestic incident but held on an outstanding warrant for an unpaid traffic ticket. Glass asked Clark and a second officer, Robert Marsh, if she could make a phone call to notify someone of her arrest – and that’s when things turned violent. The two officers reportedly strapped Glass to a restraint chair, pepper sprayed her face and punched her – leaving her fearing for her life, according to the news site. Glass, a mother of three children, has asthma and told the Plain Dealer that she struggled to breathe during the two hours when officers assaulted her and then left her tied to a chair. Cuyahoga County has yet to release detailed information on the incident, prompting the Plain Dealer to file a claim with the Ohio Court Claims to release documentation, including videos, on the case. During Monday’s arraignment, Cuyahoga County Judge Nancy Margaret Russo set Clark’s bond at $5,000 and required him to be monitored by GPS once out on bond. 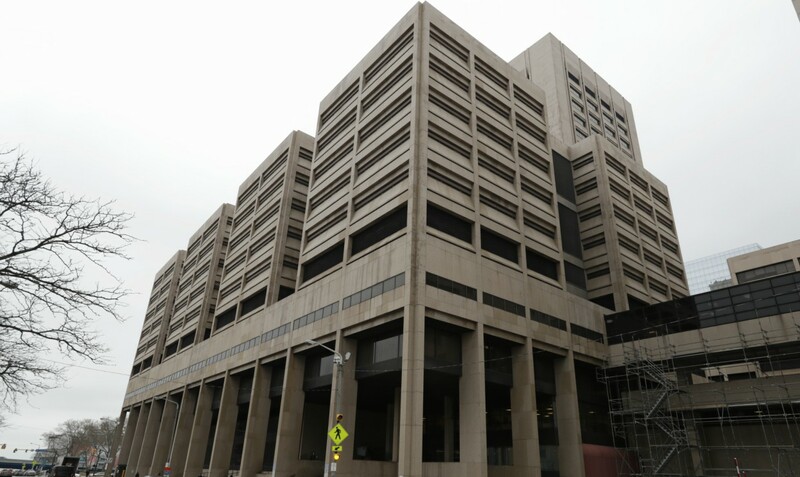 Meanwhile, four other current and former Cuyahoga County jail officers pleaded not guilty last Wednesday in separate, unrelated arraignments on civil rights violations against other inmates at the jail. Eight inmates died last year at the jail, where the U.S. Marshals Service found officers used excessive force and kept inmates in “inhumane” conditions. After the indictments were filed, the current officers, including Clark, have each been placed on unpaid administrative leave. A fifth officer was terminated on Dec. 4.